Perfect for gardens in temperate climates, hydrangeas need a winter dormancy that is punctuated with frost and subfreezing temperatures. However, if a hydrangea shrub is leafy or in bloom, frost will scald it and turn the plant tissue brown, and the petals and leaves will drop off. Untimely spring frosts can kill flower and leaf buds on shrubs, and reduce or prevent flowering later in spring and summer. 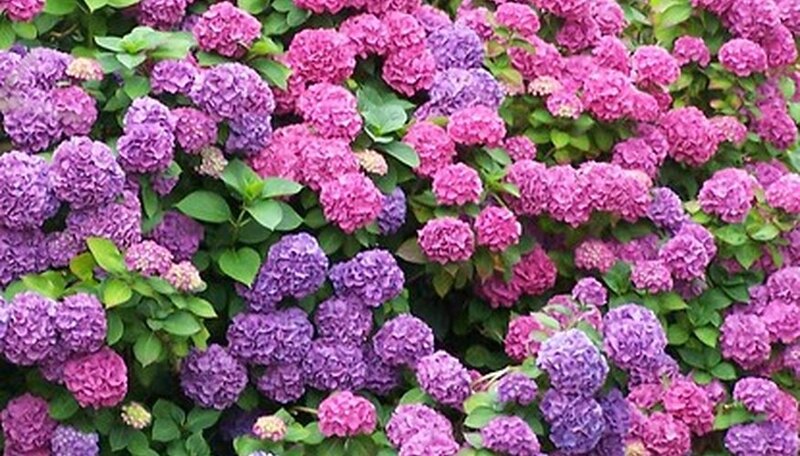 According to the American Horticultural Society's book, "A-Z Encyclopedia of Garden Plants", about seven species of hydrangea are widely cultivated. Common hydrangeas include the smooth hydrangea (Hydrangea arborescens), Sargent's hydrangea (Hydrangea aspera), bigleaf hydrangea (Hydrangea macrophylla), peegee hydrangea (Hydrangea paniculata), oakleaf hydrangea (Hydrangea quercifolia), mountain hydrangea (Hydrangea serrata), climbing hydrangea (Hydrangea petiolaris) and Villosa hydrangea (Hydrangea villosa). These non-tropical shrubs grow in regions with cool to cold winters, in USDA Hardiness Zones 3 through 9. Each species or hybrid hydrangea has unique, varied hardiness within these zones. These zones are susceptible to frosts in autumn and winter, where average minimum temperatures drop below 30 degrees Fahrenheit. In spring, when flower buds swell, a late season frost causes buds to drop off, diminishing the future flower display. Protect shrubs from a late frost by covering them with a cloth sheet or blanket when unseasonal cold is forecast. Plants nipped by frost should be cleaned and pruned only when there is no further threat of frost in spring. Frost causes hydrangeas' petals and leaves to turn brown in early to mid-autumn. Although the petals may be lost, some foliage may remain and over the course of the next 3 to 14 days may change from green to rust, orange, or burgundy before fully falling off the shrub. Old, dried flowers that remain on the shrubs will not be affected by the cold. Hydrangeas forced in containers for seasonal florist sales are susceptible to leaf and flower damage if exposed to freezing temperatures. These potted plants are grown in greenhouses and if abruptly exposed to cold air will be harmed during transport or if accidentally left outdoors on the patio on a frosty night. The plants won't be killed, but the foliage and flowers will turn brown. Hydrangeas are shrubs native to eastern North America and eastern Asia where cool to cold winters occur. The hydrangea needs the autumnal frost to start its annual dormancy. The prolonged temperatures below 40 degrees Fahrenheit in winter allow the flower buds to open fully the following spring. Newer modern hydrangea hybrids, such as the bigleaf hydrangea, do not need winter cold flower. Frosts and cold winter temperatures kill insects and eggs. Leaves infected by sooty mold are killed and drop from the shrub. The cold helps to kill drying, sickly and old stems.